﻿"Once upon a time, there were two ogres. One was red, and the other was blue. The red ogre (oni translated to English) wanted to become friends with children in a village nearby. So, the red ogre put up a sign in front of his house: Home of a Gentle Ogre, All Are Welcome, Tea and Tasty Cakes Available. But no one showed up, and the red ogre grew puzzled, sad, and angry. "I'm such a kind ogre -- why would nobody visit me?" Despairing, the red ogre even tore down the sign: "This is useless." Moved by his friend's feelings, the blue ogre said, "Look, I have a plan." The blue ogre's plan was for him to pretend to terrorize children and then have the red ogre chase him off, "rescuing" them from him. The plan went without a hitch, and the red ogre became the most popular creature among the children, and all came to play with him. After a happy day of enjoying the children's company, the red ogre found a letter from the blue ogre. The letter said, "My Dear Red Ogre, if people find out that you are a friend of the Bad Blue Ogre's, they will not let the children come to you any more. So, I'm leaving. Please live happily with the children. Goodbye. Blue Ogre." The red ogre cried out, "Blue Ogre is gone! A dear friend of mine! He is gone!" And he wept. The red ogre and the blue ogre were never to see each other again." The blue oni in this story acts out of kindness and selflessness to help the red oni who is determined to be viewed as friendly, which contrasts the negativity commonly associated with oni. Reider's underlying tone of "cultural baggage" however can still be seen within in the story's plot. When asked why the author chose to depict oni in such a way, Hamada responded, "I felt that I should like to bestow a good intention on the oni. If the reader pities the well-intended oni and feels compassion towards him, then such a sentiment would undoubtedly be extended to thoughtfulness and compassion for other people's feelings" (Reider quoting Hamada 171). Like many other children's stories, Hamada is trying to instill morals within children and alter the appearance of themes within society. 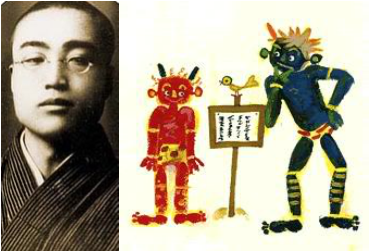 According to Reider, Hamada's story began the notion of oni fiction depicting oni as an alter ego of people (171). 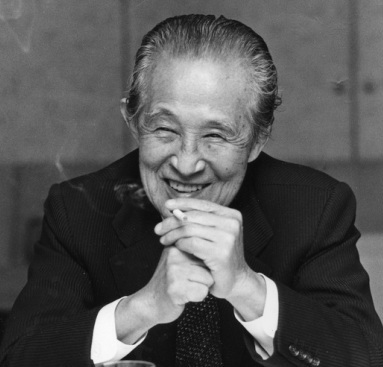 Reaching beyond children's literature, Japanese novelist Inoue Yasushi placed the positive oni in a new scene and developed it in one of his autobiographical short stories, "Oni no hanashi" (Story of Oni, 1970). Within his story, Inoue developed the oni not as horrifying but as a deceased person. This notion is similar to the early Chinese depiction of the oni of being a soul or spirit of the dead. For instance, the narrator in the story had a deceased uncle who he thought had turned into an oni because he had seen mental images of his dead uncle with horns jetting out of his forehead. The narrator noted within the story that while his uncle had horns, his face was not frightening but rather, it was a realistic depiction of his appearance when he was alive. Since his uncle had not taken on evil qualities with his transformation into an oni, the narrator was sympathetic to him because of the positive memories he associated with the oni (Reider 174). Through both Inoue and Hamada, oni have begun to take on positive connotations which may help to further explain the motivation of getting the oni as a tattoo.